Tensor cores provide a huge boost to convolutions and matrix operations. 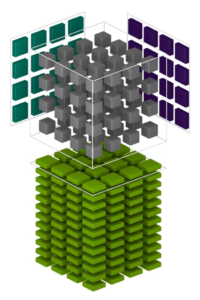 Tensor cores are programmable using NVIDIA libraries and directly in CUDA C++ code. A defining feature of the new Volta GPU Architecture is its Tensor Cores, which give the Tesla V100 accelerator a peak throughput 12 times the 32-bit floating point throughput of the previous-generation Tesla P100. Tensor Cores enable AI programmers to use mixed-precision to achieve higher throughput without sacrificing accuracy. In this blog post we show you how you to use Tensor Cores in your own application using CUDA Libraries as well as how to program them directly in CUDA C++ device code. Each Tensor Core provides a 4x4x4 matrix processing array which performs the operation D = A * B + C, where A, B, C and D are 4×4 matrices as Figure 1 shows. The matrix multiply inputs A and B are FP16 matrices, while the accumulation matrices C and D may be FP16 or FP32 matrices. Figure 1: Tensor Core 4x4x4 matrix multiply and accumulate. Each Tensor Core performs 64 floating point FMA mixed-precision operations per clock (FP16 input multiply with full-precision product and FP32 accumulate, as Figure 2 shows) and 8 Tensor Cores in an SM perform a total of 1024 floating point operations per clock. This is a dramatic 8X increase in throughput for deep learning applications per SM compared to Pascal GP100 using standard FP32 operations, resulting in a total 12X increase in throughput for the Volta V100 GPU compared to the Pascal P100 GPU. Tensor Cores operate on FP16 input data with FP32 accumulation. The FP16 multiply results in a full-precision result that is accumulated in FP32 operations with the other products in a given dot product for a 4x4x4 matrix multiply, as Figure 8 shows. Figure 2: Volta GV100 Tensor Core operation. During program execution, multiple Tensor Cores are used concurrently by a full warp of execution. The threads within a warp provide a larger 16x16x16 matrix operation to be processed by the Tensor Cores. CUDA exposes these operations as warp-level matrix operations in the CUDA C++ WMMA API. These C++ interfaces provide specialized matrix load, matrix multiply and accumulate, and matrix store operations to efficiently utilize Tensor Cores in CUDA C++ programs. But before we get into the details of low-level programming of Tensor Cores, let’s look at how to access their performance via CUDA libraries. Many computational applications use GEMMs: signal processing, fluid dynamics, and many, many others. As the data sizes of these applications grow exponentially, these applications require matching increases in processing speed. The mixed-precision GEMM performance chart in figure 3 shows that Tensor Cores clearly answer this need. Both performance charts show that Tesla V100’s Tensor Cores provide multiple times the performance of the previous-generation Tesla P100. Performance improvements this large change how work is done in computational fields: making interactivity possible, enabling “what-if” scenario studies, or reducing server farm usage. If you use GEMMs or convolutions in your applications, use the simple steps below to turbocharge your work. You can take advantage of Tensor Cores by making a few changes to your existing cuBLAS code. The changes are small changes in your use of the cuBLAS API. The following sample code applies a few simple rules to indicate to cuBLAS that Tensor Cores should be used; these rules are enumerated explicitly after the code. The following code is largely the same as common code used to invoke a GEMM in cuBLAS on previous architectures. The routine must be a GEMM; currently, only GEMMs support Tensor Core execution. The math mode must be set to CUBLAS_TENSOR_OP_MATH. Floating point math is not associative, so the results of the Tensor Core math routines are not quite bit-equivalent to the results of the analogous non-Tensor Core math routines. cuBLAS requires the user to “opt in” to the use of tensor cores. All of k, lda, ldb, and ldc must be a multiple of eight; m must be a multiple of four. The Tensor Core math routines stride through input data in steps of eight values, so the dimensions of the matrices must be multiples of eight. GEMMs that do not satisfy the above rules will fall back to a non-Tensor Core implementation. As mentioned, Tensor Cores deliver several times the GEMM performance over previous hardware. Figure 3 shows the comparative performance of GP100 (Pascal) to GV100 (Volta) hardware. Figure 3. 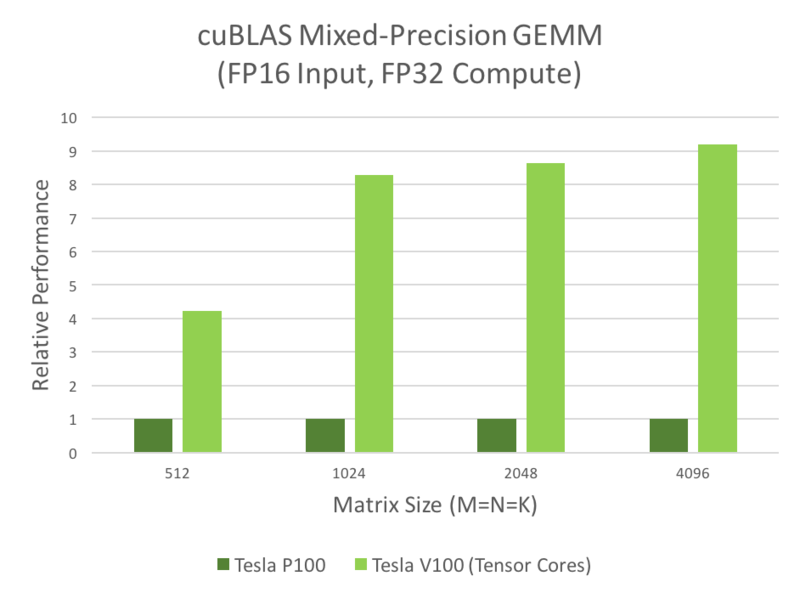 Performance comparison of matrix-matrix multiplication (GEMM)s on Tesla V100 (Volta) using Tensor Cores versus Tesla P100 (Pascal). Input matrices are half precision, computation is single precision. Using Tensor Cores in cuDNN is also easy, and again involves only slight changes to existing code. The convolution algorithm must be ALGO_1 (IMPLICIT_PRECOMP_GEMM for forward). Other convolution algorithms besides ALGO_1 may use Tensor Cores in future cuDNN releases. The math type must be set to CUDNN_TENSOR_OP_MATH. As in cuBLAS, the results of the Tensor Core math routines are not quite bit-equivalent to the results of the analogous non-tensor core math routines, so cuDNN requires the user to “opt in” to the use of Tensor Cores. Both input and output channel dimensions must be a multiple of eight. Again as in cuBLAS, the Tensor Core math routines stride through input data in steps of eight values, so the dimensions of the input data must be multiples of eight. The input, filter, and output data types for the convolutions must be half precision. Convolutions that do not satisfy the above rules will fall back to a non-Tensor Core implementation. The above sample code shows NCHW data format, see the conv_sample.cpp sample for NHWC support as well. As mentioned, Tensor Cores deliver several times the convolution performance over previous hardware. Figure 4 shows the comparative performance of GP100 (Pascal) to GV100 (Volta) hardware. Figure 4. 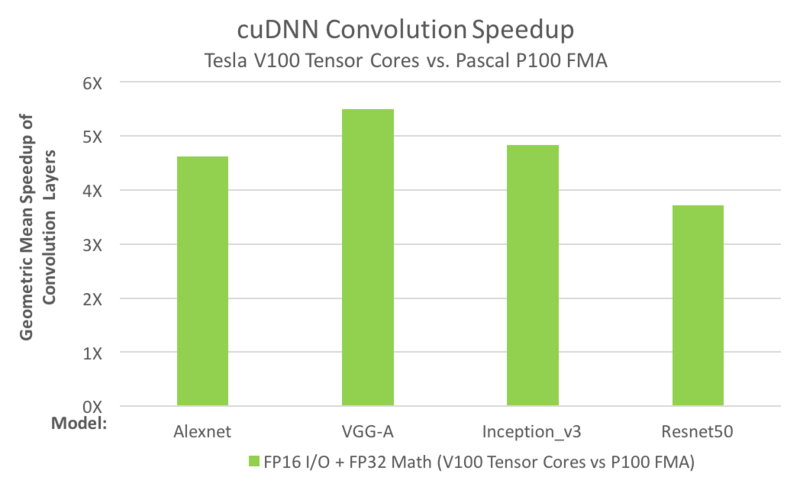 Performance comparison of convolution on Tesla V100 (Volta) with Tensor Cores versus Tesla P100 (Pascal). The comparison is between the geometric means of run times of the convolution layers from each neural network. Both V100 and P100 use FP16 input/output data and FP32 computation; V100 uses Tensor Cores, while P100 uses FP32 fused-multiply add (FMA). Access to Tensor Cores in kernels via CUDA 9.0 is available as a preview feature. This means that the data structures, APIs and code described in this section are subject to change in future CUDA releases. While cuBLAS and cuDNN cover many of the potential uses for Tensor Cores, you can also program them directly in CUDA C++. Tensor Cores are exposed in CUDA 9.0 via a set of functions and types in the nvcuda::wmma namespace. These allow you to load or initialize values into the special format required by the tensor cores, perform matrix multiply-accumulate (MMA) steps, and store values back out to memory. During program execution multiple Tensor Cores are used concurrently by a full warp. This allows the warp to perform a 16x16x16 MMA at very high throughput (Figure 5). Let’s go through a simple example that shows how you can use the WMMA (Warp Matrix Multiply Accumulate) API to perform a matrix multiplication. Note that this example is not tuned for high performance and mostly serves as a demonstration of the API. For an example of optimizations you might apply to this code to get better performance, check out the cudaTensorCoreGemm sample in the CUDA Toolkit. For highest performance in production code cuBLAS should be used, as described above. The WMMA API is contained within the mma.h header file. The complete namespace is nvcuda::wmma::*, but it’s useful to keep wmma explicit throughout the code, so we’ll just be using the nvcuda namespace. The full GEMM specification allows the algorithm to work on transpositions of a or b, and for data strides to be larger than the strides in the matrix. For simplicity let’s assume that neither a nor b are transposed, and that the leading dimensions of the memory and the matrix are the same. The strategy we’ll employ is to have a single warp responsible for a single 16×16 section of the output matrix. By using a two-dimensional grid and thread blocks, we can effectively tile the warps across the two dimensional output matrix. // Leading dimensions. Packed with no transpositions. Before the MMA operation is performed the operand matrices must be represented in the registers of the GPU. As an MMA is a warp-wide operation these registers are distributed amongst the threads of a warp with each thread holding a fragment of the overall matrix. The mapping between individual matrix parameters to their fragment(s) is opaque, so your program should not make assumptions about it. In CUDA a fragment is a templated type with template parameters describing which matrix the fragment holds (A, B or accumulator), the shape of the overall WMMA operation, the data type and, for A and B matrices, whether the data is row or column major. This last argument can be used to perform transposition of either A or B matrices. This example does no transposition so both matrices are column major, which is standard for GEMM. The final part of the initialization step is to fill the accumulator fragment with zeros. The strategy we’re using for the GEMM is to compute one tile of the output matrix per warp. To do this we need to loop over rows of the A matrix, and columns of the B matrix. This is along the K-dimension of both matrices and produces an MxN output tile. The load matrix function takes data from memory (global memory in this example, although it could be any memory space) and places it into a fragment. The third argument to the load is the “leading dimension” in memory of the matrix; the 16×16 tile we’re loading is discontinuous in memory so the function needs to know the stride between consecutive columns (or rows, if these were row-major fragments). The MMA call accumulates in place, so both the first and last arguments are the accumulator fragment we previously initialized to zero. acc_frag now holds the result for this warp’s output tile based on the multiplication of A and B. The complete GEMM specification allows this result to be scaled, and for it to be accumulated on top of a matrix in place. One way to do this scaling is to perform element-wise operations on the fragment. Although the mapping from matrix coordinates to threads isn’t defined, element-wise operations do not need to know this mapping so can still be performed using fragments. As such, it’s legal to perform scaling operations on fragments or to add the contents of one fragment to another, so long as those two fragments have the same template parameters. If the fragments have different template parameters the results are undefined. Using this feature, we load in the existing data in C and, with the correct scaling, accumulate the result of the computation so far with it. Finally, we store the data out to memory. Once again the target pointer can be any memory space visible to the GPU and the leading dimension in memory must be specified. There is also an option to specify whether the output is to be written row or column major. With that, the matrix multiplication is complete. I’ve omitted the host code in this blog post, however a complete working example is available on Github. Hopefully this example has given you ideas about how you might use Tensor Cores in your application. If you’d like to know more, see the CUDA Programming Guide section on wmma. The CUDA 9 Tensor Core API is a preview feature, so we’d love to hear your feedback. If you have any comments or questions please don’t hesitate to leave a comment below. CUDA 9 is available free, so download it today. Jeremy Appleyard is a developer in NVIDIA's European Developer Technology team. Based near Oxford, England, he works with developers accelerating applications on GPUs. He holds a Ph.D in computational fluid dynamics from Cranfield University. Scott Yokim is a senior software engineer in the CUDA libraries team at NVIDIA. He joined NVIDIA in 2008, prior to which he was a computer graphics programmer at various companies. Scott holds a MS in mathematics from Virginia Tech.